My fellow Americans, our brief national nightmare is over – the NFL's regular referees are headed back to work. After three weeks of blown calls, no calls and reversed calls; of physical contact and verbal intimidation; of confused Vegas bookmakers and infuriated fantasy players; and less than 48 hours after what is perhaps the most bizarre ending to a football game not involving a Stanford trombone player, the NFL and the NFL Referees Association reached an agreement Wednesday. "Our officials will be back on the field starting [Thursday] night," NFL Commissioner Roger Goodell said in a statement, referring to the Cleveland Browns-Baltimore Ravens contest. Meanwhile, the much derided replacement refs can return to the ball fields of Division III, junior college and the lingerie league. We're sure Bill Belichick sends his regards. Score this one for public pressure, as the NFL, under intense scrutiny and criticism, finally acknowledged that the job of referee isn't just a replaceable occupation. As a tidal wave of tumult grew over the season's first three weeks – capped by Sunday and Monday nights' nationally-broadcast embarrassments – the league's hypothesis that it could pretty much round up anyone off the street, put them in striped shirts and the game would go on fine was over. So the NFL, despite plenty of posturing and hardline talk to the end – what would a labor fight be without that – made a deal. The refs will meet in Dallas on Friday and Saturday to ratify the eight-year contract and pick up their equipment and assignments. The pension deal they fought to preserve will remain for the next five years, according to reports, then it goes to 401Ks. There is a four percent pay raise. The rest no one cares about. No one ever cared about any of it actually. This was never about who won or who lost a labor deal. Until the lockout, few people knew or cared that the refs even had a union. In the end, the NFL was battling over $3.3 million per year in pension payouts. That was a meager $103,125 per team per year for a $9 billion-plus industry. The entire "labor dispute" would have been comedic except players, coaches and fans wondered when it would be their team intercepting a Hail Mary and losing the game anyway. The details on why the NFL finally budged will emerge in the days to come, but at this point, credit the owners, commissioner Roger Goodell and the referees' union for making this less about ideology and more about giving an insatiable customer base that's made them all wealthy [or wealthier] what they deserve. 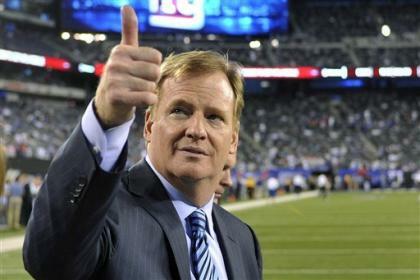 "I want to give a special thanks to NFL fans for their passion," Goodell said. "Now it’s time to put the focus back on the teams and players where it belongs." 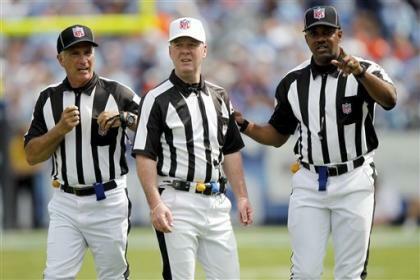 The NFL miscalculated and then mishandled the replacement refs from the start. The league initially found a weak crop to take the job, unable to lure top college officials either because they were already under contract or simply unwilling to leave regular high-level work for what was always likely to be just a few pay checks. The result was an unqualified and at times incapable crew from high schools, small colleges and one preseason ref even fired from the Lingerie League for a lack of ability. The jump to the bigger, faster, most complicated and far more intense NFL was impossible. While bad calls have always been and will continue to be part of the game – no one can officiate football perfectly – the replacement refs too often lost control of the flow and integrity of the games. There were too many flags or too much confusion. Play dragged, the action got choppy and rules were confused. They tried their best and at times did quite well. Other times, however, refs were intimidated by home crowds [Vegas began adjusting lines in accordance] as well as the vocal complaints of famous players and coaches. It's one thing to ignore the complaints of a 16-year-old sophomore. It's another when it's Ray Lewis. The league failed to protect the replacement's psyche by offering zero tolerance for complaints from players and coaches. Instead, the substitute teachers were mostly thrown to the wolves. Weeks of watching enraged stars, often just trying to gain an edge from what they perceived as a weak official, grated on fans and broadcasters. All the arguing further undermined the replacements' credibility. By Monday night, when two confused officials met in the corner of a Seattle end zone and tried to make sense of a contested last-second game-winning pass/interception, the situation had become untenable. The NFL tried to claim it was the proper call on Tuesday but few believed them. The idea of sending the same officials into Week 4 – where each mistake, even ones the regular refs would make, was set to be dissected – was something the NFL couldn't stomach. Neither could it deal with another week of fining future Hall of Fame coaches or rosters of players hammering the league on Twitter. The replacement ref debacle had turned the NFL into a laughing stock and if there is one thing the league that likes to call itself "The Shield" despises, it's being mocked. Heartless, cheap, unfair, they can deal with. Just don't laugh at them. Roger Goodell knew that much and after receiving the brunt of the blame for the lockout; he deserves credit for being in charge when the tide so quickly shifted. Facing a crisis of its own making, the NFL humbled itself and compromised. Three weeks into a bad experiment and less than 48 hours after a humiliating error it couldn't recover from, and the deal is done. The NFL is back. Finally, in full.